While this was intended to be a six-week trip, this 20-day excursion crammed a lot in. Here are a few things I learned on this, and previous, trips. Well-maintained and cleaned pit toilets are not that bad. Solar panels and absorbent glass mat (AGM) batteries on a trailer are the best thing ever. Quiet and take care of themselves. There are not enough jumbo Ziploc bags in the world to put around a gas tank and generator to prevent gas smell from getting in your car. Get a good campground book, or the AllStay app. On weekends, stay away from the most popular parks. For a good walk-in site in a popular park, get there early. Like maybe 10am. Call ahead to the park office(s) to get a feel for whether it’s a busy day. On short notice, go to popular parks when fair-weather campers cancel due to a less-than-ideal forecast. If you have a self-contained trailer, boondocking on Bureau of Land Management (BLM) lands can be amazing. And cheap. And a little scary, if you haven’t done your homework. So do your homework. Campground hosts are great. And friendly. They know the good hikes, the best spots, and the best way to stay in one. If you want to stay in their campground, ask them a few questions the day before about how to get one of the walk-in sites (if any). In a pinch, Walmart camping is not that bad. Ask at the Walmart (or call ahead) to be sure it’s OK. Don’t put your awning out, you’re just there to sleep. Buy a few things.Twice on my trip, it was a godsend to just have a place to pull over to sleep. People who camp all have interesting stories. Talk to them. Wave when you drive by. The deeper off the beaten track you encounter campers, the more likely they are to be friendly and helpful. Assume the best of people until proven otherwise. 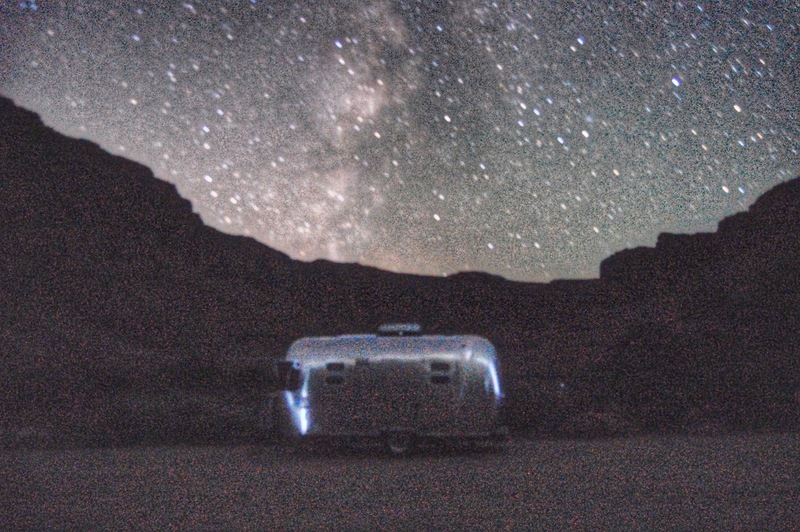 Everyone loves Airstreams. The usually want a tour, wonder what year it is, and how much they cost (not necessarily in that order). Do not leave your awning up when you leave. You will make mistakes and/or do something stupid. Don’t beat yourself up about it. Move on. Invite an old friend (or brother) to join you on part of the trip. Pack a good rain coat. Keeping speed down below 65 really helps with mileage. Going faster over a rutted dirt road seems easier on the car and trailer. 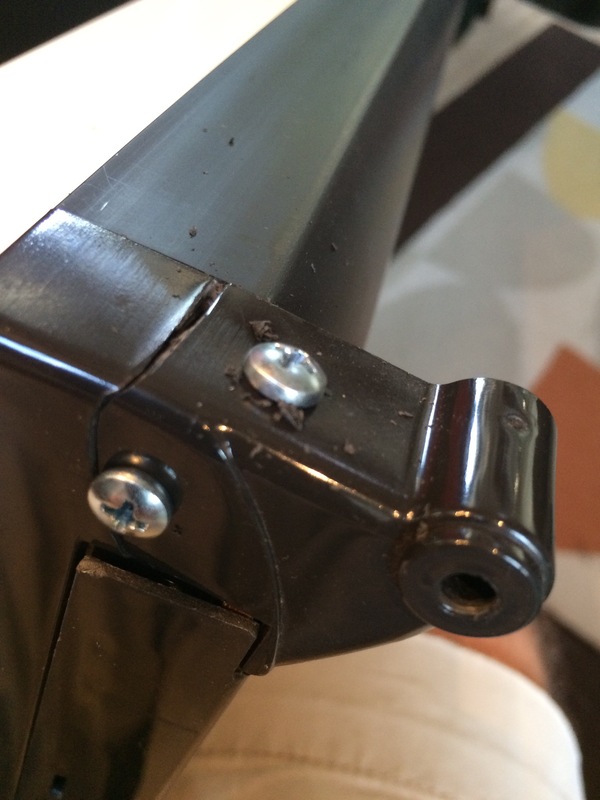 52 cents worth of screws will fix a broken fridge door. Duct tape counts as a “tool” and there’s always room for it. Check your tire pressure regularly. I’ve had a blow-out. It’s not pretty. You will never need any spare part you bring. Anything that can vibrate loose, will. Especially in a single-axle trailer. Screws. Doors. Door catches. Ovens. Gas fittings. Look around and catch them before it’s too late. If you find a screw on the floor, it probably came off something. Pack your fridge carefully. Heavy items on the bottom. Don’t weigh down the door compartments more than you need to. Everything falls/rolls to its lowest point. You can make Jell-O in the morning, and even in a moving trailer, it will be firm in a few hours. There are some surprisingly beautiful state parks out there. Try them. There are some surprisingly awful state parks out there. Avoid them (see AllStay app). Pennsylvania roads are the worst. Rest Stops get scary after dark. So, avoid driving after dark. Assume everyone at a rest stop after 10pm is a prostitute. Truckers would rather pee next to their truck than walk fifty yards to the bathrooms. Eat/Stop before you get hungry/tired. By the time you need to eat/stop, there will be no place to do it. In most cases, use gearing (not brakes) to lower your speed on downward mountain slopes. Don’t let others rush you. Smile and wave as they pass you. You’re on vacation, towing a cool trailer. Even if you’re driving cross-country, you will see some of the same people at rest-stops and gas stations in multiple states. Be nice to them. 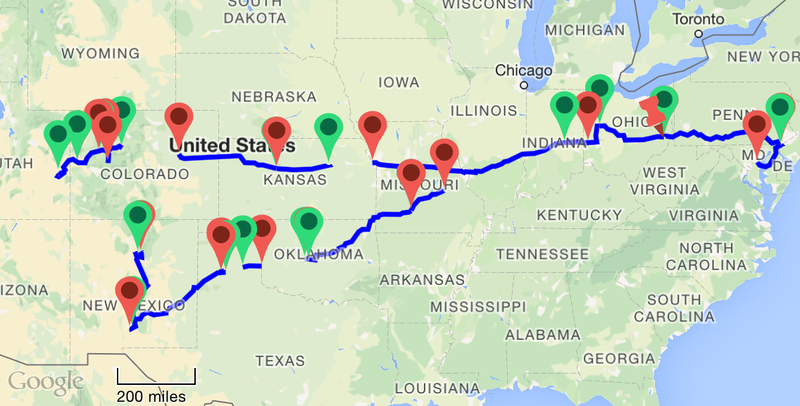 At the end of my 2012 summer trailering adventure, I thought it would be interesting to post a summary of expenses for the 28-day trip. great blog post, my sweetheart and I laughed out loud at a few of the “what I have learned” list entries. Can totally relate. Keep blogging. Love the photos too. Enjoyed your blog! Keep it coming. We aren’t new to camping but just purchased an Airstream and although I caught your blog on the tail end of your trip, I’m working my way back through your earlier posts and I’ve laughed out loud several times already! Thanks for sharing! Dan, I very much enjoyed reading your “What I learned this summer” blog. Your tone and pertinent observations of the Airstreaming / camping experience were insightful and entertaining. Would you mind if I included this segment of your blog in the WBCCI Newsletter “News and Views” in a future issue? Of course I’d give you proper attribution. If you give me permission, would you be willing to give me a little background on yourself and your trip? Sounds like you do this every summer. Yes. Mostly thru AirForums (http://www.airforums.com/) and some Facebook groups. Good info and sadly most of us have learned these the hard way. What amazes me is your attitude. I love how you did not let it ruin the fun and memories you had while you were able to travel. Thank you so much for your wonderful blog and incredible photos!!! Truth be told, there was a minute or two of swearing when I discovered the broken awning that would make a sailor blush (and my brother is retired Navy). Good blog and good ideas. We lived in the Wilmington area before retiring to VA. Love it there and Chester a County, PA. One thing to consider….convert your generator to propane….no more gas smell. Hook it to your trailer tanks for fuel. I did my Yamaha, and it works great.